What is a Schoolvision assessment? I struggled with reading things, it took me a while and I didn't understand what I was reading... the improvement in my reading, understanding and the speed I now do my work is amazing! At Optical3 everybody is incredibly friendly and makes it go as smoothly as possible... I read a lot quicker than normal now, which has been a life-saver when it comes to cramming in revision before an exam! 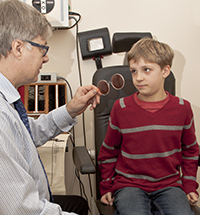 I have been going to Optical3 for the past 3 years with both of my sons and Geraint has helped them with Dyslexia problems. I have and would recommend him again.